Beetroot is native to North Africa, Europe, and Asia where the plant grows along the coasts. By the end of the Roman civilisation, beets were widely cultivated as food. But it was not until the 19th century that people became aware of beet’s natural sweetness. While the beetroot’s stems and leaves were the parts originally consumed, nowadays, the first thing that comes to mind about beetroots is the root. You’ll be amazed by the variety of colours available— it’s not just red, beetroots can be white, yellow, pale red, purple; hybrid ones even have stripes. Today, beets are used for heaps of things, from a material for making sugar to eating beetroot and the greens in raw form. Not only are beets naturally sweet and delicious; they’re also packed with plenty of nutrients. Beetroot’s consist of water, carbohydrates, fibre, vitamins, minerals, antioxidants, and some proteins. Moreover, they’re fat-free. Nitrates: Beetroots is high in nitrates. Our body will convert these nitrates to nitric oxide. In turn, nitric oxide helps blood vessels to relax and dilate, thereby, lowering blood pressure and improving blood circulation. There’s more: According to researchers, adults who drink beetroot juice tend to have improved blood flow to their brains, preventing the onset of dementia and cognitive decline. Dietary fibre: Rich in fibre, beetroots help reduce bad cholesterol in the body. Betacyanin, flavonoids, and carotenoids: A group of pigments called betacyanins is what gives beetroot its vibrant red colour. These phytonutrients have antioxidant properties which help maintain a healthy heart. Flavonoids and carotenoids are also antioxidants. We already mentioned nitrate’s effect on blood circulation. 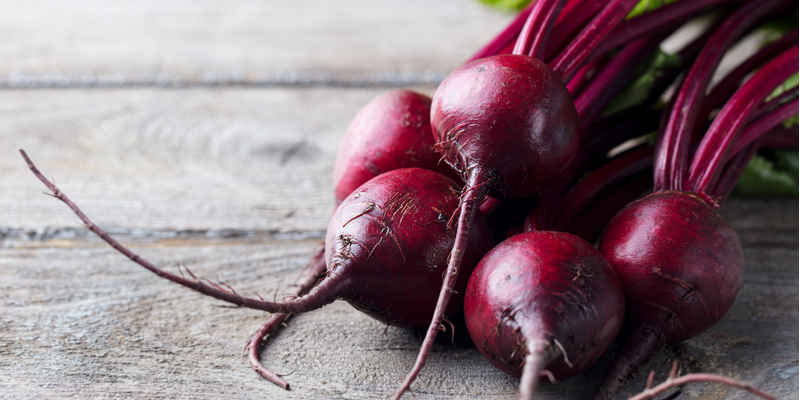 Thanks again to nitrates, beetroot can also boost stamina to help you exercise longer. According to researchers, nitrates decrease the body’s oxygen uptake—a process that makes you tire quickly. This makes beetroot good for decreasing the oxygen cost of low-intensity exercises (like walking) and enhancing one’s tolerance for high-intensity activities. Furthermore, both beet’s root and leaves contain iron. Anemia is linked with fatigue, so having sufficient iron in the body will help you fight those lethargic symptoms. Not only do the phytonutrients in beetroots help in reducing cholesterol, they are also lauded for their cancer-fighting and detoxification properties. Research on the affects in animals have shown that beetroot works against tumour formations. In humans, beetroot juice is now being examined for possible use against breast, pancreatic, and prostate cancers. Beetroot’s cancer-fighting properties have been attributed to betanin, a type of betacyanin. Also, betanin can protect cells, organs, and other body components against inflammation, environmental stress, and chronic diseases. It supports detoxification too, helping the body get rid of toxins in the blood and liver. Beetroots are high in folate. This is good for skin health, as folate promotes cell production and repair. Certain studies also point to folate’s possible effect against skin cancer. Beetroot contains vitamin C, vitamin B6, and trace minerals like magnesium, potassium, manganese, and phosphorus. It contains silica which helps the body utilise calcium—an excellent way to reduce the risk of osteoporosis. Also, 100g of cooked beetroot will provide 200kJ of energy – talk about a power boost. But due to beetroot’s high sugar content, we advise moderating your consumption. Grate it and eat it raw, or steam it lightly. Crush it as part of your vegetable juice. Pickle it and add it to salads, pasta, and (of course) hamburger. Here’s a simple salad: beetroot with carrots, celery, walnuts then dress with honey and cider vinegar. Marinade and roast beetroot with herbs (like thyme), crushed garlic, salt, lemon juice, and olive oil. You now have a delicious side dish for grilled fish or meat. Prepare borscht (a thick soup that’s loved by Europeans). How do you prepare borscht? For 7-8 minutes, sautee beetroots and onions in butter over medium-low heat. Sprinkle salt and pepper. Add in pre-made beef broth then simmer for 20 minutes. Add cabbage, parsley, nutmeg, and maybe sherry or lemon juice. Simmer for a few more minutes. Adjust the final taste to your liking with salt and pepper, then you can whizz it up or leave it chunky. If you like, you can add some sour cream to serve. When buying beetroots, pick the ones with smooth skin and without any splits. Dry or shrivelled looking ones will have a woody taste. When looking at the leaves, pick beets with greens that look fresh and have undamaged stems and/or leaves. If you’re not cooking them right away, you can store them in the fridge. Trim the top, wipe them clean, and store them in the fridge inside an airtight, plastic bag; they should last for two weeks. However, for the greens, eat or cook them within two days of purchase. If you want to grow a crop of beetroots yourself, you can easily cultivate them all year round. Beet likes cool conditions so make sure to water frequently. For the best-tasting results, harvest your beets once the root is as big as a golf ball. In Australia, peak harvest season usually happens between May and November.